Our mature mechanical drive solutions (pumps and compressors) provide end users with a variety of unit control options to protect the machine from unsafe operating conditions and optimized algorithms match the machine’s throughput to varying process requirements. Our generator drive solutions provide your unit the capability to operate in isochronous or droop mode and when necessary switch between the two modes. This operational flexibility allows you to extend Black Start capabilities to designated machines to increase system availability and reliability. 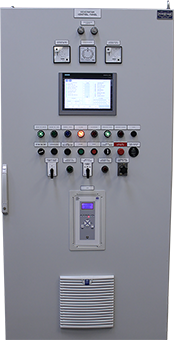 Our control system applications are suitable for both new equipment and retrofit applications. New equipment installations leverage the unique advantages of open architecture systems, providing end users with an appropriate level of integration to manage their rotating assets from the enterprise level, while simultaneously providing tightly integrated controls at the operational level. In addition to these benefits, retrofit equipment performance and reliability is often increased due to technology upgrades available in new controls. Petrotech does more than simply replace the current level of control functionality. We bring your equipment to the current state-of-the-art technology. For example a retrofitted gas turbine control system coupled with our single fuel valve installation, allows aging two-valve system installations to benefit from our patented soft-light off algorithm using the latest fuel control valve complete with on-board diagnostics and position tracking. In compressor stations, our capacity control systems provide end users the ability to fully automate the loadsharing of their compression assets. This eliminates the need for station personnel to manage unit operations at the site, thus freeing them up to perform necessary facility maintenance tasks. Meanwhile, remote operators can manage the station throughput to match process demands. Our process control systems can provide the necessary redundancy and safety integrity to meet the unique requirements of critical process equipment such as FCCU air blowers, wet gas compressors, propylene, ethylene and many other process compressors.